Getting to and from the three major New York area airports can be expensive and time-consuming. So, plan ahead. 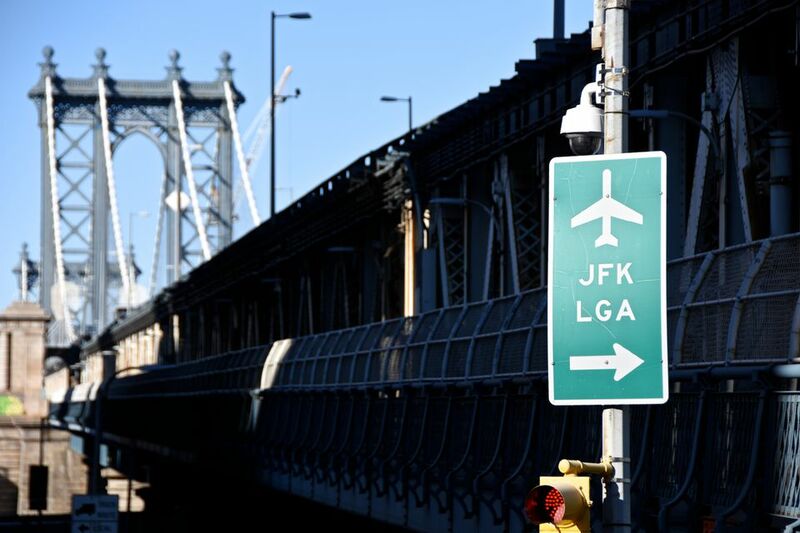 Here are ideas about how to navigate your way to and from Brooklyn to New York City's three airports: JFK International Airport (JFK), LaGuardia Airport (LGA), and Newark Liberty International Airport. In general, the most expensive Brooklyn-to-airport trip is to Newark, followed by JFK, and then LaGuardia. JFK is the easiest to access via public transportation. But none of the area airports is served by a direct rail connection to Brooklyn, as you might find in some European cities. You have five options for getting to and from JFK airport. You can either call a ride-sharing service or use the green "Boro taxis" to prearrange a pickup in Brooklyn. Allow about an hour for travel time. Alternatively, you can take ridesharing services like Uber or Lyft, which became legal in the state of New York in April 2017. You can take the AirTrain which will leave you at various points in NYC that are accessible to Brooklyn via subway or you can take the AirTrain and LIRR combo. Also, MTA's Trip Planner offers real-time travel options for taking the AirTrain and subways with estimated times depending on the day and hour you'll be en route. You can take the NYC Airporter, which leaves JFK Airport about every half hour and takes passengers to Port Authority Bus Terminal, Grand Central Station, and Penn Station in Manhattan. These can be organized in advance. The vans are larger than cabs but are also are more expensive. The airport website recommends Airlink New York, All-County Express, and ETS Air Shuttle. Recommended private car services include Carmel Super Saver, Dial 7 Car & Limousine, and ExecuCar. Of course, you can drive and park your car in an overnight lot. Check the airport parking website for rates and information, and to see how full various parking lots are as well as current pricing. As with JFK, you have five options for getting to and from Brooklyn to LaGuardia. You can either call a ride-sharing service or use the green "Boro taxis" to prearrange a pick up in Brooklyn. Allow a half hour to an hour for travel time; ask the dispatchers. You won't have to pay any tolls for your trip to Laguardia and back, but tips, a cabbie waiting time if you arrange a pickup, parking, and any other fees are not included. Good news: There are no additional fees for extra passengers. This is the least expensive option, so read the full details on traveling between Brooklyn and LaGuardia via public transportation. Also check out MTA's Trip Planner for real-time travel options, with estimated times depending on the day and hour you'll be en route. You can catch a private express bus to and from LaGuardia that departs about every half hour. Going to the airport, you can catch the bus at Manhattan's Port Authority Bus Terminal, Grand Central Station or Penn Station. Coming from the airport, the NYC Airporter bus will drop you at these same major transportation centers. From these hubs, you can easily pick up a subway from anywhere in Brooklyn. Reservations for shared-ride vans and private car services can be made at the welcome center located on the arrivals level of each terminal. If the counter is closed, there is a convenient self-service kiosk nearby where you can contact authorized shared-ride or private car services. Note that these are only cost-effective if you are traveling with a group; otherwise, they will be more expensive than a cab. You can also drive to LaGuardia. There's onsite parking, as well, for a fee. Check the website to determine which terminal has availability. Although many Brooklynites use JFK or LaGuardia, Newark is a viable and easy option. If you've booked tickets from Newark, here are three ways to help you get to the airport—and back—without (hopefully) any hassles. You can save some cash by taking public transportation to Newark. Use the subways to connect to the Newark AirTrain from any point in Brooklyn, or from Newark to Brooklyn. It's the cheapest way to go, and sometimes (for instance on Thanksgiving and other busy holidays) also the fastest. AirTrain Newark doesn't take you into Manhattan or Brooklyn. It's just a quick ride from (or around) the airport to a dedicated "Rail Transfer Station,” where you then board a regular New Jersey Transit commuter train into New York Pennsylvania Station. There are escalators and elevators in case you have heavy luggage. The most comfortable way to get to and from Newark is also the most expensive: By taxi or car service. It's a long trip so be prepared to pay for the service. You can call a car service or use the green "Boro taxis" to prearrange a pick up to take you to Newark. Reserve a day in advance, or two days during the holidays. If you're not up for using an app, you can go old school and call one of the car services—those services also go to and from Brooklyn to Newark Airport.